This recipe is a pot roast version of pork asado. The process of browning the meat in oil before cooking it on it’s own marinade is what this recipe differs from the usual pork asado. In other terms, this is called “braising”. Browning the meat brings out the taste in meat but you can skip that process and go ahead by mixing all the ingredients in the pot then cook it until the meat is tender. I’ve tried it and they are both delicious. Specially when you serve it with steamed rice. To cook asado pot roast; Mix all marinade ingredients in a bowl. Marinade pork for 30 minutes. Drain pork from the marinade and scrape off excess liquid from the meat. Brown the meat in cooking oil on all side, skin side down first. When all the sides are browned, add water to the same pot where you brown the meat, add the marinade and simmer for 1 hour and 40 minutes or until the meat is tender. Mix all marinade ingredients in a bowl. Marinade pork for 30 minutes. Drain pork from the marinade and scrape off excess liquid from the meat. Brown the meat in cooking oil on all side, skin side down first. When all the sides are browned, add water to the same pot where you brown the meat, add the marinade and simmer for 1 hour and 40 minutes or until the meat is tender. Slice before serving. Makes 8 servings. 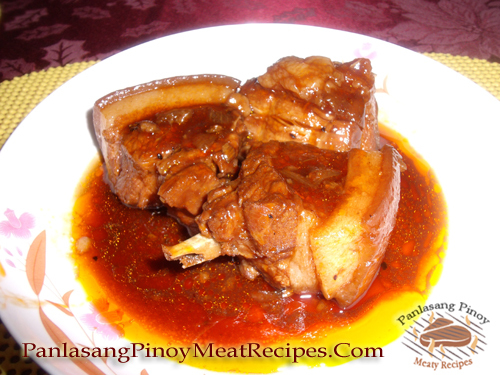 I love Panlasang Pinoy Recipe The Best. Hi Teresita, you can use dry white wine to substitute sherry. Some people prefer Shaoxing wine, a kind of Chinese cooking wine.